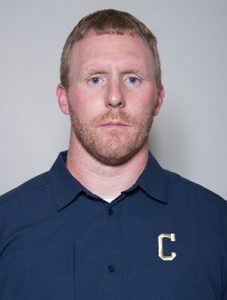 CLARION, Pa. – Clarion head football coach Chris Weibel announced today that longtime assistant coach Brian Steiner has been elevated to the position of interim defensive coordinator. Steiner will fill the vacancy held by former defensive coordinator James Thomas, who accepted a coaching position at Angelo State. Steiner will continue to work with the Golden Eagles’ defensive line as he has throughout his tenure in Clarion. Originally hired in March 2009, Steiner has served as the defensive line coach for the past 10 seasons, and at one point spent four seasons as the team’s recruiting coordinator. The defensive line has been a bright spot for the Golden Eagles since Steiner’s arrival, with 16 All-PSAC West selections since the start of the 2009 season. Included in that total is two-time PSAC West Defensive Athlete of the year Julian Howsare, who signed professional contracts with the NFL’s New York Jets and Seattle Seahawks before making his way to the Canadian Football League (CFL). In 2018, Steiner coached three Golden Eagles to All-PSAC West squads, including First Team selection Brandon Vocco. Vocco was also named to the Don Hansen Football Gazette All-Super Region 1 Second Team defense. Alec Heldreth earned his second straight all-conference nod in 2018, while Saif Khan won the honors for the first time in his career. Other defensive linemen with multiple All-PSAC West honors under Steiner include Barrington Morrison (2010-11) and Ben Maund (2009-10). In addition to athletic honors, Steiner’s charges have also excelled in the classroom. Matt Koerper was a 2015 CoSIDA Academic All-America selection. As recruiting coordinator, Steiner has helped produce two of the larger signing classes in Clarion history in 2016-17. The Golden Eagles inked a total of 31 players on those two National Signing Days, with droves of recruits committing on subsequent dates as well. Steiner came to Clarion from Dayton, where he coached the defensive line for three seasons. In 2007 the Flyer “D” was ranked #4 nationally in total defense, #1 in sacks and #2 against the run. In 2008 the defense was #2 nationally against the run and #7 in scoring defense. A resident of Clarion, Steiner is married to his wife Kari-Beth.